Environmental Protection Agency Administrator Scott Pruitt leased a Washington apartment owned by a lobbyist friend last year under terms that allowed him to pay $50 a night for a single bedroom — but only on the nights when he actually slept there. White House officials are growing dismayed about the questions surrounding Pruitt’s living arrangement, including his initial inability to produce any documentation about the lease or his actual payments, according to three officials. The landlord provided EPA officials with a copy of the lease and proof of the payments Pruitt made. In all, Pruitt paid $6,100 to use the room for roughly six months, according to copies of rental checks reviewed by Bloomberg News. Those checks show varying amounts paid on sporadic dates — not a traditional monthly "rent payment" of the same amount each month. That was because of the unusual rent schedule — not a single monthly amount, but a daily amount charged only for days used for a single bedroom in the two-bedroom unit just blocks from the Capitol. The building is at least partially owned by a health care lobbyist, Vicki Hart, via a limited liability corporation. Her husband J. Steven Hart, is also a lobbyist, whose firm represents clients in industries regulated by the EPA. One person familiar with the lease compared it to an Airbnb-style arrangement, but Pruitt wasn’t a transient and instead made the apartment his home on nights he was in Washington. The lease — also reviewed by Bloomberg — says that he was charged $50 a night "based on days of actual occupancy." Bloomberg reviewed six canceled checks paid by Pruitt totaling $6,100 from March 18 through Sept 1, 2017. He paid $450 on March 18, $900 on April 26, $850 on May 15, $700 on June 4, $1,500 on July 22 and $1,700 on Sept 1. A sampling of current listings of apartments for rent near Pruitt’s temporary pad showed studio and one-bedroom offerings available for $1,350 to $1,975 a month. Some of the current Airbnb listings for rentals of single bedrooms inside apartments and homes on Capitol Hill ranged from $45 to $68 per night. Justina Fugh, who has been ethics counsel at the EPA for a dozen years, said the arrangement wasn’t an ethics issue because Pruitt paid rent. An aide said the agency had not reviewed the arrangement in advance. The payments covered Pruitt’s room in the two-bedroom unit, but did not afford him liberal use of common areas, where the owners had dinner parties and other functions, according to a person familiar with the situation. According to the lease agreement, Pruitt’s bedroom could not be locked. ABC reported Friday that Pruitt’s college-age daughter used another room in the condo while serving as a White House intern. An email to agency representatives seeking comment on the report were not immediately returned. After ABC News reported the living arrangement on Thursday, EPA aides had to seek documentation from the building’s owners to prove he had paid rent, raising concerns at the White House, said two of the people, who asked not to be named discussing a sensitive matter involving a Cabinet secretary. Pruitt was in Wyoming on Thursday. The disclosure follows revelations about Pruitt’s reliance on first-class flights to travel around the globe and a series of pricey trips, including a visit by Pruitt and agency staff to Italy that cost $120,249. EPA officials have defended Pruitt’s use of first-class flights on security grounds, but after a series of reports, he shifted to coach. J. Steven Hart is the chairman of Williams & Jensen, a firm with a stable of energy industry clients including Oklahoma Gas & Electric Co., which paid the firm $400,000 in 2017, according to data compiled from the Environmental Integrity Project from disclosure forms. Pruitt, the former attorney general of Oklahoma, has been an enthusiastic crusader against Obama-era regulations meant to combat climate change and limit air pollution. When Pruitt was in Oklahoma, he sued the EPA more than a dozen times. Hart’s individual lobbying clients include liquefied natural gas exporter Cheniere Energy Inc.
Pruitt traveled to Morocco to tout U.S. liquefied natural gas last December, though the Department of Energy — not the EPA — plays the major federal role overseeing LNG exports. It is not clear Hart had direct contact with the EPA on behalf of any of his lobbying clients in 2017, according to a Bloomberg News review of disclosures. Other individual clients of his are the American Automotive Policy Council and Smithfield Foods Inc.
Hart, in a statement to the Associated Press, described Pruitt as a friend from Oklahoma with whom he had scant contact. “Pruitt signed a market based, short-term lease for a condo owned partially by my wife,” Hart said in a statement. “Pruitt paid all rent owed as agreed to in the lease. My wife does not, and has not ever lobbied the EPA on any matters." Critics said the unorthodox rental arrangement allowing Pruitt exclusive, reserved use of the room raised questions and could violate a ban on federal government employees accepting gifts valued at more than $20. 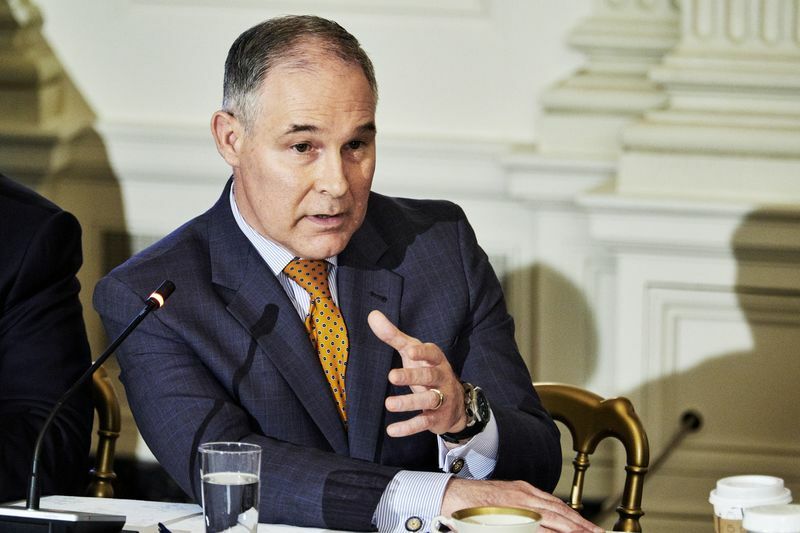 “At the very least, it doesn’t look good for the administrator of EPA to have rented an apartment from the wife of an energy industry lobbyist who represents companies regulated by EPA," said Eric Schaeffer, director of the Environmental Integrity Project. The government watchdog group Public Citizen asked EPA’s inspector general to investigate. "This appears to be a gift from a lobbyist to the EPA administrator," Craig Holman, government affairs lobbyist for Public Citizen, said in a news release. "Scott Pruitt seems to be renting at well below market value – from a family member of a lobbyist who has business before the EPA." Messages left with the Inspector General’s office weren’t immediately returned on Friday. Fugh, the EPA’s ethics counsel, said no gift was involved. It was a routine business arrangement between Pruitt and an individual, not a lobbying firm, she added.